Daddy’s Girl is not as ‘in-yer- face’ as it could have been. There have been some horrifying portrayals of prison life in recent years – examples include the motion picture Starred Up, which I mention specifically because of its broadly similar parent-child dynamic, also in evidence in this play. A play called The Exonerated has a 2011 run at Charing Cross Theatre, and an American musical, The Scottsboro Boys, enjoyed a West End transfer from the Young Vic in 2014. This play, Daddy’s Girl, is reliant more often than not on descriptions of events that have already occurred: on-stage enactments happen too, but are scarce. One sticking point, however: it was never entirely clear (unless I blatantly missed it) precisely why Terry (Mark Wingett) has received a life sentence, though it is inferred he has the possibility of parole. The narrative is multi-layered, with both the lives of Terry and his daughter Eliza (Georgia Brown) told through a series of phone calls, interspersed with flashbacks from the past to give context to the conversations of the present day. The generational gap between the two characters is a vehicle for a significant amount of the humour in the play, while the seeming inconsistencies in the day and date a particular scene is in and the programme Terry is watching in his cell (he sees an episode Strictly Come Dancing, a weekend show, on a Monday) are indicative of one day being pretty much the same as ‘yesterday’ and ‘the day before’, and so on. The use of videos (Alex Vipond) and projections are done the way they should be done – smoothly, and supporting the production without detracting from the theatrical performances themselves. When the occasion calls for it, text messages are on display for all to see – a decent way of demonstrating a method of the younger generation’s non-verbal communication without pretentiously reading texts out loud. What the texts say takes us too far into spoiler territory, but in the near-ubiquity of the mobile telephone, I wondered whether the play was trying to suggest that one does not necessarily need to be detained at Her Majesty’s pleasure to be enslaved or imprisoned to something. Eliza even takes a call in the middle of the night, with her beloved phone in her bed. FFS, as it were. Eliza’s lack of sentimentality reflects a personality that makes her credibly a chip off the old block, so to speak – her dismissal of a certain romantic film based on a romantic novel had me in stitches, for example. Elements of Terry’s life are fascinating, despite the mundaneness of being ‘inside’ – the prison system does not, for instance, put him in any sort of prison workshop for him to do anything productive. It takes a critical incident in Terry’s cell, though, for both father and daughter to fully come to their senses. I think, given the ‘press information’ I was supplied with beforehand, I would have liked even more emphasis on prison life. This is, either way, a short show but one that is well-paced and well-acted. Daddy’s Girl is not as ‘in-yer- face’ as it could have been. There have been some horrifying portrayals of prison life in recent years – examples include the motion picture Starred Up, which I mention specifically because of its broadly similar parent-child dynamic, also in evidence in this play. A play called The Exonerated has a 2011 run at Charing Cross Theatre, and an American musical, The Scottsboro Boys, enjoyed a West End transfer from the Young Vic in 2014. This play, Daddy’s Girl, is reliant more often than not on descriptions of events that have already occurred: on-stage enactments happen too, but are scarce. One sticking point, however: it was never entirely clear (unless I blatantly missed it) precisely why Terry (Mark Wingett) has received a life sentence, though it is inferred he has the possibility of parole. Eliza’s lack of sentimentality reflects a personality that makes her a credible chip off the old block, so to speak – her dismissal of a certain romantic film based on a romantic novel had me in stitches, for example. Elements of Terry’s life are fascinating, despite the mundaneness of being ‘inside’ – the prison system does not, for instance, put him in any sort of prison workshop for him to do anything productive. It takes a critical incident in Terry’s cell, though, for both father and daughter to fully come to their senses. I think, given the ‘press information’ I was supplied with beforehand, I would have liked even more emphasis on prison life. This is, either way, a short show but one that is well-paced and well-acted. A passionate and energetic production that received a deserved standing ovation on its opening night. An excellent debut play from Georgia Brown. 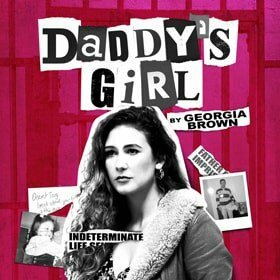 This heartfelt, heartwarming and hilarious play follows the story of Terry, banged up in prison for life, and his daughter, Eliza, a millenial struggling to find love, money and meaning. Theatre. 27th & 28th Jan, 18:10, £15. CONTAINS IMAGES OF A STRONG SEXUAL NATURE.